The Boxing Truth® is currently in the process of formulating a feature entitled “A Call For Action.” As a writer, controversy always is something to live by. As a true fan of the sport of Boxing I have had just about enough of incompetence, rumors, and many controversial atrocities merely swept under the rug. I am asking for feedback regarding the avid Boxing fans view and insight on the sport of Boxing. I am proposing the need for an “Independent Boxing Association” on a national level which much like Baseball, and Football would govern all facets of the sport in the United States. The Boxing world was saddened by the recent news of the passing of former WBO Heavyweight world champion Tommy Morrison at the age of forty-four. Morrison will go down as one of most devastating punchers in the history of the Heavyweight division. Morrison’s punching power almost instantly made him a hot prospect shortly after turning professional in 1988. This observer has often said that Morrison was one of the hardest punchers that I have ever seen, a fighter who was a “Knockout Artist.” Morrison’s aggressive style along with his devastating left hook quickly made him one of the most exciting fighters in the Heavyweight division in an era that included such fighters as Riddick Bowe, Lennox Lewis, Michael Moorer, Evander Holyfield, Ray Mercer, Mike Tyson, and George Foreman among others. One thing that I will always remember about Tommy Morrison was that in addition to his ability to end fights with one punch, he was always willing to go toe to toe with whomever he was fighting. Sometimes this willingness did not always benefit Morrison, but from a fan’s perspective it did provide plenty of action. Whether he won or lost Morrison always came to fight. Upon hearing the news of Morrison’s passing thoughts began to run through my mind of some of the memorable bouts in Morrison’s career. In his fight with Ray Mercer in 1991, Morrison was able to control the fight in the first three rounds using head movement and combination punching in bringing the fight to Mercer. Mercer however, was able to take control of the fight in the fourth round and in the fifth round unleashed a sudden and brutal barrage as he trapped Morrison in his own corner and landed by some estimates fifteen or more unanswered punches before the bout was stopped. Mercer’s knockout of Morrison remains one of the most brutal in Boxing history. Although Morrison lost that fight in what was the first loss of his career, he proved that he was a player in the Heavyweight division. Morrison would rebound from that loss to win four fights all by knockout leading to his fight with Heavyweight contender Joe Hipp on June 27, 1992. At this point in Morrison’s career, he had more than proven to be a commodity as a power puncher. Questions however, remained regarding his stamina as he faded after winning the early rounds against Ray Mercer, but also prior to his fight with Hipp had never been stretched beyond a six round distance. In this fight Morrison showed he could fight in a measured tactical pace fighting from the outside keeping Hipp at distance with his jab and mixing in combinations. Morrison however, would also show his mettle in this fight. Two left hooks from Hipp would briefly stagger and open a cut over Morrison’s right eye in round four. Morrison would respond by knocking Hipp down with a flush right hand in the opening moments of the fifth round. To his credit, Hipp also showed his toughness getting up from the knockdown and continuing to fight on. From rounds six through eight, the “Game” Joe Hipp became the effective aggressor landing combinations and dictating the pace of the fight. Morrison meanwhile, appeared to be fighting fatigue at the end of the eighth round. This was after all the first time that Morrison had been extended to such a distance in a professional fight. As the contest entered the ninth round it appeared as though Hipp may very well have been able to work his way back into the fight on the scorecards. Morrison however, would bring the fight to a sudden and dramatic conclusion staggering Hipp with a flush right hand followed by a barrage ending with another right hand that sent Hipp down to the canvas. Hipp could not beat the count. Morrison had scored what was to that point the most dramatic knockout of his career. A testament to Morrison’s toughness was that in a post-fight interview he revealed that he had suffered a broken jaw in the second round and hurt his right hand which would later be determined was broken in the fourth round. As much as Morrison showed his mettle in this fight so too did Joe Hipp who some believed was a light hitter. Morrison himself would praise Hipp who suffered a shattered cheekbone in the bout as one of the hardest punchers that he had ever fought. It was one of the best fights of 1992. 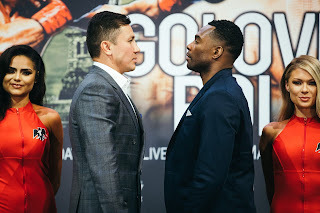 Morrison would continue to take part in exciting fights including surviving two knockdowns at the hands of former two-time world title challenger Carl “The Truth” Williams to score a come from behind eighth round knockout. In this observer’s view however, Morrison’s best performance came on June 7, 1993 when he defeated the legendary George Foreman for the vacant WBO world title. Prior to this fight many including myself believed that the fight would likely be an exciting battle between two of the most devastating punchers in Boxing history for however long it lasted. Morrison however, would surprise most observers by opting to box Foreman, keeping the former Heavyweight champion at distance utilizing good movement and elusiveness. Quite frankly, if one were to have bet prior to the fight that Morrison would have been able to remain an elusive target and out box George Foreman for the majority of twelve rounds that person would have won a lot of bets. An argument could be made that on that night Morrison won the lottery in winning the Heavyweight title. Not only did Morrison win the title by pulling off what some considered was an upset over the betting favorite Foreman, but he also was able to show that he was underrated as a boxer when he chose to box rather than go toe to toe. Morrison would successfully defend his world title under somewhat bizarre circumstances two months later, scoring a fourth round knockout over contender Tim Tomashek. Tomashek had stepped in to fight Morrison after original challenger Mike Williams withdrew from his challenge of Morrison on the night of the fight. Morrison however, would lose the WBO title, being knocked down three times, losing the title via first round knockout to unheralded contender Michael Bentt in October of 1993. The upset loss to Bentt and loss of his world title prevented Morrison from a potential multi-million dollar unification bout with then undefeated WBC champion Lennox Lewis. Following the loss to Bentt, Morrison would again rebound to win three out of four bouts, including earning a ten round split decision draw in his fight with journeyman contender Ross Purity in July of 1994. Morrison would then be pitted against another “Knockout Artist” in former number one contender Donovan “Razor” Ruddock. Much like Morrison, Ruddock was a fighter known for his ability to end fights with one punch, but was also known for being willing to stand and go toe to toe with whomever he was fighting including in two fights with former Heavyweight champion Mike Tyson. The collision between the two “Knockout Artists” Morrison and Ruddock took place on June 10, 1995. The anticipation of a war between the two was understandable and the fight more than lived up to that anticipation. Ruddock landed two uppercuts in the first round that sent Morrison to the canvas. Morrison would respond in the second round by landing several combinations including an uppercut of his own staggering Ruddock causing him to briefly grab the top rope with his glove as he was stunned. This caused Referee Ron Lipton to issue a rare standing eight count. Ruddock was able to recover and was able to win rounds four and five in my opinion based on his ability to back Morrison up with power punches. Morrison however, although looking fatigued was still very much in the fight. The impression as the fight entered round six was that although these two warriors had each had their say in trading power punches for five rounds; that it was Ruddock who was seemingly starting to take control. Morrison however, would have other plans. A vicious counter left hook from Morrison knocked Ruddock flat on his back midway through the round. In all truth and honesty Tommy Morrison landed as perfect a left hook as a fighter can land. Ruddock showed his mettle in miraculously getting up from the knockdown that would have ended the night for most Heavyweights. Morrison would close the show later the round forcing another standing eight count on Ruddock and then finally a stoppage of the bout in the final seconds of round six. Tommy Morrison will be remembered for having his career cut short by a positive HIV test in 1996 which would later be the subject of much debate when Morrison attempted a comeback ten years later claiming that the test that derailed his career was a result of a false positive. After two successful knockout wins in 2007 in 2008 respectively, Morrison retired with a record of 48-3-1, with 42 knockouts registering a career knockout percentage of nearly 81%. Although some may question the circumstances of his passing, I am one who prefers to remember Tommy “The Duke” Morrison as a fighter who contributed much excitement to the sport of Boxing. A fighter who win or lose always gave it everything he had, every time he stepped in the ring. A fighter who displayed heart, courage, and the mentality of a warrior. Regardless of what one’s opinion of Tommy Morrison as a boxer might be, his courage cannot be questioned. Morrison one might argue was part of the last great era in the Heavyweight division. Even though Morrison lost a few fights along the way this observer believes that Morrison has more than earned his place in any Hall of Fame associated with the sport of Boxing as well as in Boxing history. While there may be questions and debates regarding Morrison’s place among the all-time great Heavyweights, although there may be questions regarding his passing, this observer chooses to remember and give this legend the recognition he rightfully earned. Tommy “The Duke” Morrison Former Heavyweight Champion of the World.